Throughout history symbols have been used in a variety of ways, often playing important roles. Each state has its own representative symbols - ranging from seals, flags, and buildings to rocks, minerals, plants, and animals - but how did they come to be chosen? 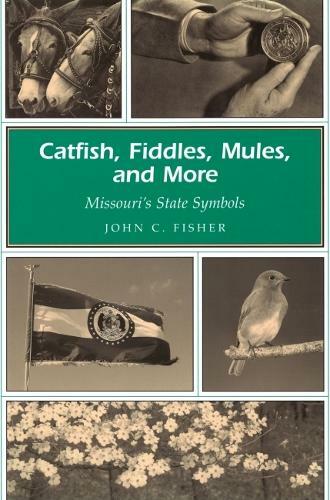 In Catfish, Fiddles, Mules, and More, John C. Fisher provides an answer to that question for Missourians with a handy reference on the various official symbols of the state. Fisher explores each of the symbols adopted by the legislature as well as the state nickname and the legislative process in Missouri. A chapter is devoted to each symbol, providing information about when it was adopted, why it came to be considered as a state symbol, and how it relates to and is representative of the state. For those symbols that are items of economic importance to the state, the nature of their contribution is also provided. In the case of animal and plant symbols, their biology and where they occur within the state is presented. This important work, which includes thirty illustrations, will be helpful in acquainting Missourians and others interested in the state with not only the state's symbols but the history of Missouri as well. Because the symbols were adopted over a long period of time, much of Missouri's history has been included in the course of discussing them. Thoroughly researched and well written, Catfish, Fiddles, Mules, and More fills a niche for this kind of information in a way no other work has done. It will be valuable to anyone with an interest in Missouri, and it will be particularly useful to elementary and high school students in their study of the state.